10. Automatic windshield wipers – I have these, and they are actually pretty nice. I also have automatic headlights that only come on if it is dark outside. 9. Soda can cool zone – So sad! I have this feature in my car. I hardly ever keep a soda in there, but now my wallet is crisp and cool like a new pillow. 8. Smart transmission – mainly in electric cars. But, BMW does have a crazy feature that you can change your car into manual without a clutch. It gives you the feeling of shifting gears, winding it out without the pedal. 6. Multiple owner’s manuals – I have a crazy, huge owner’s manual that is in three separate parts. The maintenance manual and the operator’s manual are two separate books. I barely have room for anything else in my glove box. 5. 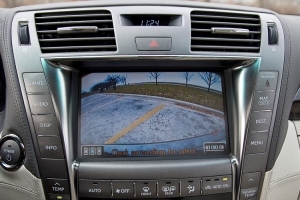 Self-parking cars – Using the dash mounted camera, the Lexus LS will parallel park for you. I wonder if you can use this on the driver’s license test. Maybe I would have passed the first time I took it when I was 16. 4. iDrive – Audi, BMW, and Mercedes all have a central knob that will help you navigate the radio, DVD player, navigation system, air conditioner, and other features right on your arm rest at the tips of your fingers. 3. Voice turn-by-turn navigation – I actually think that this is one of the greatest inventions. Maybe it is a waste of money a little bit, but I like them. 2. Heart-rate monitor – Wow! Are you serious? Vovlo’s S80 comes with a heart-rate monitor linked to the key fob that will tell you if there is person hiding in the backseat. How ridiculous! 1. Aggressive driver’s seat – BMW’s 7 Series has a drivers seat with a built in massager.